Education in Detroit has changed radically in recent years. It's about to change even more. 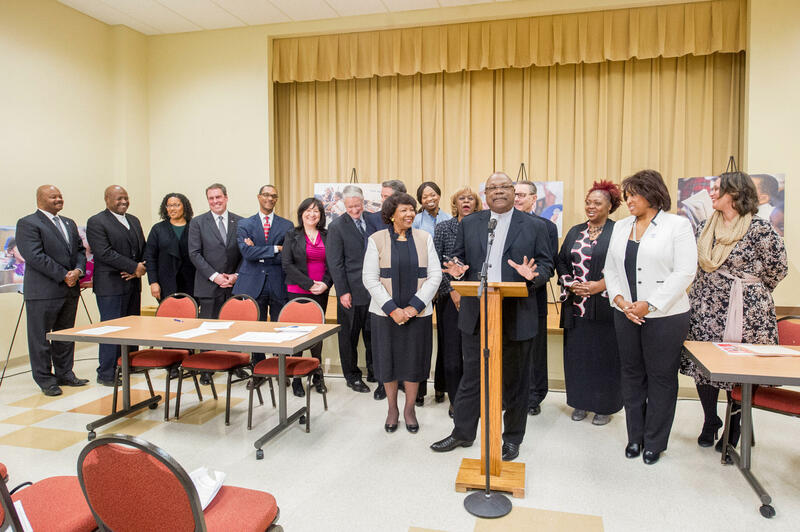 Leaders of the Coalition for the Future of Detroit Schoolchildren at an introductory press conference in December, 2014. Over the past two decades, nearly everything about going to school in Detroit has changed. School choice has meant an explosion of charters in and around the city. Now, more Detroit kids attend charters than traditional public schools. As for Detroit Public Schools, the district has been under some kind of state control for 12 out of the past 15 years. Despite these changes, most people feel like the schools situation in the city has gotten worse, not better. And that’s sparked pledges from state lawmakers, local leaders, and education advocates alike that as the city emerges from bankruptcy, it’s time to “fix” Detroit’s education problems once and for all. “I was a single mom raising four kids in the city of Detroit, and have seen and lived firsthand the devastating effects on our children of the decisions of many people — most of whom are from outside of our city, have made about education for our children,” says Angela Reyes, Executive Director of the Detroit Hispanic Development Corporation. Reyes is also a co-chair of the Coalition for the Future of Detroit Schoolchildren. That group just formed in December. It has a large and diverse membership, drawing people from education, non-profit, business and labor circles. Skillman Foundation CEO Tonya Allen, another co-chair, says the group’s task is nothing less than coming up with recommendations for a top-to-bottom, radical overhaul of all Detroit schools. “We want to inform everybody about what needs to happen, on a policy level as well as a practice level, to improve schools for children,” Allen says. The coalition’s meetings are private, but leaders report its efforts are still in the “fact-finding” stage. They’ve already been briefed by Gov. 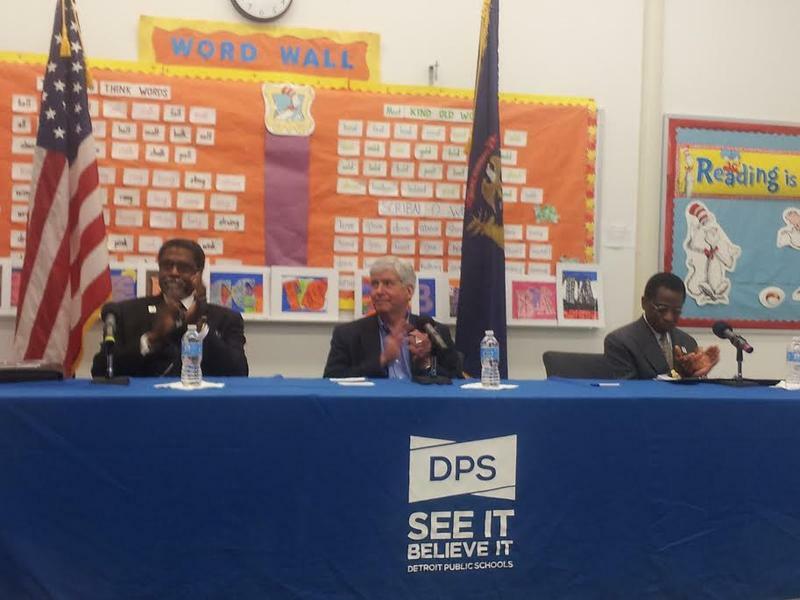 Snyder, Detroit Mayor Mike Duggan, and various education experts. Nonetheless, Allen says it’s pledged to provide the governor with recommendations by the end of March — and Snyder has said he plans to move on them soon after that. But the coalition isn’t Snyder’s only source of advice for broad education reforms in Detroit and beyond. Right now, Paul Pastorek is serving as a kind of at-will consultant to the Snyder administration. He’s “on loan” from the Broad Foundation, a prominent — and controversial — player in the national education reform scene. Pastorek is best-known as the former state superintendent of schools in Louisiana, and for completely re-making New Orleans schools in the wake of Hurricane Katrina. “When he was in Louisiana he promoted charter schools extensively, he promoted privatization of the public schools, and he also promoted increased accountability,” says Gary Miron, a Western Michigan University education professor who has studied Pastorek’s time in Louisiana extensively. "We in Detroit are just now pushing for a model that has not withstood either empirical research validation, or support from the general public where it's been tried." During that time, the traditional public school system in New Orleans basically ceased to exist. It was replaced by what’s broadly known as a “portfolio model” — a collection of largely independent, mostly charter schools, run by a single coordinating manager or body. Some big players in Detroit education circles have suggested this is a natural model for Detroit, where many parents have already embraced the notion of school choice — but where a lack of coordination and quality control have sprung up as big problems. But the portfolio model has its critics. “We in Detroit are just now pushing for a model that has not withstood either empirical research validation, or support from the general public where it’s been tried,” says Thomas Pedroni, an associate professor of education at Wayne State University. In fact, the data on New Orleans’ schools post-Katrina performance has been murky. Initial data showed a major, sustained boost in test scores across most schools. But recently, even some of the new model’s original boosters have questioned the metrics underlying those test scores — in Pedroni’s view, data manipulations that “allowed failure to travel in the clothing of success” for a long time. Parental satisfaction has also been mixed. Still, it’s widely expected that something resembling the New Orleans model will end up before Snyder. Pastorek will reportedly wrap up his work in the early spring, around the same time that the Coalition for the Future of Detroit Schoolchildren will submit its recommendations to the governor. A laboratory for education "reform"
The Coalition’s likely recommendations are less clear. But they may well include a coordinating body to manage things like enrollment and transportation across Detroit’s 3 major school sectors (the Detroit Public Schools, charters, and the state-run Education Achievement Authority); and a push to restore more local control. "If something is a fantastic turnaround method, other people can certainly look at it and say, 'Is this the right fit for my community as well?'" But while the focus is very much on Detroit right now, there have also been strong hints that whatever ends up being tried there will serve as a template for other systems around the state. “If an idea works, we can look to scale in other places,” says Dave Murray, a spokesman for Gov. Snyder. “That would depend on those local communities, and what they want and what they want to look at. Whatever the case, it’s clear that Detroit will continue to serve as the main laboratory for sweeping educational change in Michigan. Depending on your point of view, the type of radical transformation in the works could make Detroit an exciting hotbed of innovation that can only improve outcomes for poor, struggling kids. Or, it could represent just another round of questionable experiments on children that have already suffered enough of them. Locally-generated solutions should drive any effort to fix Detroit schools. That’s the message coming from the Coalition for the Future of Detroit Schoolchildren, a group that formed just this week. It’s an unusually broad group that includes community, business, union, and education leaders working in the city. This week, the Detroit Journalism Cooperative is looking at how the city is functioning under bankruptcy. Mayor Mike Duggan says his top priority is reversing the city’s long population decline. But there are a couple key quality of life issues Duggan has no control over. One of them is the city’s schools. 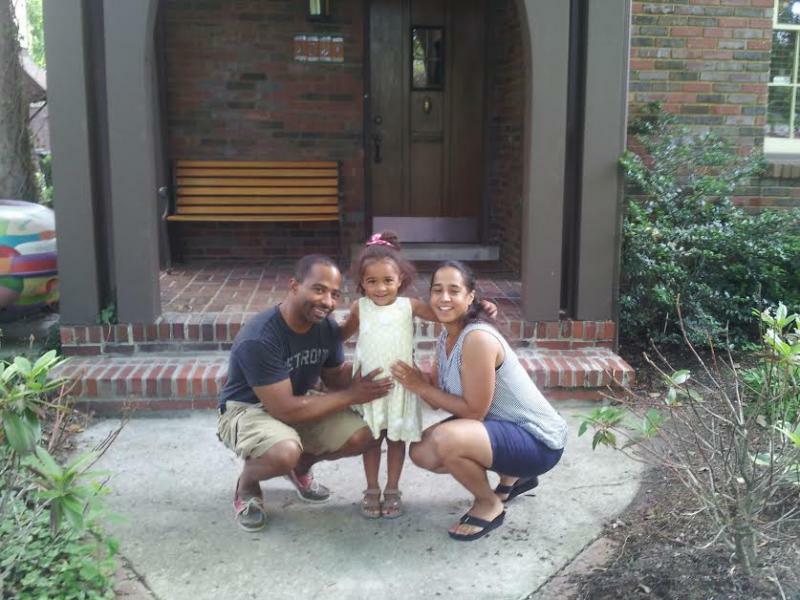 Here’s the story of one Detroit family’s effort to find good schools.